In the twentieth century, the United States emerged as the world's largest and most powerful economy. Understanding the evolution, organization and performance of the American corporate enterprise in this period is an indispensable foundation for understanding the evolution, organization, and performance of not only the US economy but also of the global economy. 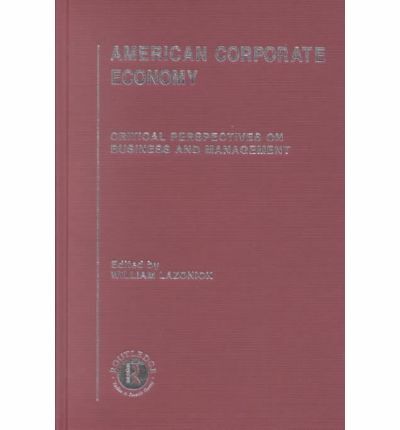 The readings collected in these four volumes examine the evolution, operation and performance of the American corporate enterprise and of the American corporate economy more generally. Many of the readings provide broad overviews of the evolution of the US corporate enterprise, while others contribute to debates on the role of US corporate enterprise in the evolution of American economy and society. The material is arranged thematically to help the reader navigate the field. There is also a new introduction and a thorough index, making this set an invaluable reference tool for both academics and practitioners in the field.